We were inspired by Lee Underwood’s guest blog last week to look into product design more ourselves. In our searches we stumbled on the eruditely articulated approach to product design by Dieter Rams. Rams, a German industrial designer closely associated with the consumer products company Braun introduced the idea of sustainable development in design in the 1970s. Accordingly he asked himself the question: is my design good design? The answer formed his now celebrated ten principles. First up “Good Design is Innovative”. This is the first blog in a four part series taking a look at how our latest product holds up to the acclaimed designers test. Click here to read more about the 10 Principles Of Good Product Design by Ian Morbey. Bring sensitivity and flexibility to your lab with the CLARIOstar microplate reader from BMG LABTECH. With its innovative LVF Monochromators™ you can quickly and easily define bandwidths of up to 100 nm and wavelengths from 320 to 850 nm, giving you maximum flexibility without compromising on performance. The new ACU also offers full atmospheric control, making it even easier to perform live cell-based assays. SPEX SamplePrep 6870D Freezer/MillThe 6870D Freezer/Mill® is a high-throughput, dual chamber cryogenic grinder with a self-contained liquid nitrogen tub and insulated case. It accommodates 0.1 to 100 grams of samples per grinding chamber. This mill chills samples in liquid nitrogen then pulverizes them with a magnetically driven impactor. Vial reaches approximately -100°C in one minute, -196°C in 4 ½ minutes. 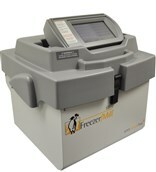 Visit the SPEX SamplePrep website the learn more about the 6870D Freezer/Mill. Rigaku SmartLab®, an advanced X-ray Diffractometer (XRD), is a versatile multipurpose X-ray diffraction system with Guidance™ expert system intelligent software. Applications include: powder diffraction, thin film diffraction, SAXS, USAXS, in-plane scattering, pole figure, residual stress and non-ambient experiments. Watch the video here. I am getting a system error S7 upon power up on our Avanti JE. Anyone have any idea what this error code is telling me. What should I be looking for. I am an experienced centrifuge tech! Advise this member. While self-checking and initializing, when I start my FTIR up, calibration fails. I leave the instrument in power on state for many days for conditioning but the issue still exists. The instrument works regularly and normal and also passes any standard tests. Can anyone help me? Advise this member. I have a Mettler AE163 that won't power on and the fuse is fine. I'm wondering about buying a donor machine with a good power supply and putting it in my machine. Is that something a bright guy could do himself to resurrect an otherwise good machine? Are similar looking models all using the same power supply? Advise this member. Correct assay plate selection is vital for successful research, whether you are performing absorbance, fluorescence or luminescence assays. Porvair Sciences offers a wide range of assay plates which are recognized as industry-leading tools for Pharma drug discovery and screening. Read more. Since the tube height with low profile screw caps is now identical to the tube height with a TPE Cap - the same low profile rack cover can be used for both types of caps increasing operational flexibility for organisations using both types of storage tube closures. Beneficially the low profile screw cap has a Torx10 screw head which makes it ideal for automated storage facilities. Read more. B&K Precision today announced the expansion of its 9115 Series with the addition of a new multi-range programmable DC power supply, model 9117. The new 9117 can deliver up to 3000 W of output power in any combination of voltage up to 80 V and current up to 120 A within its power rating. Read more. Interesting characters appear on the printout instead of the reading. Like Chinese characters, after we exchanged the Li battery. Any suggestion to solve the problem? Advise this member. I have a freeze dryer FDU-1200 in my Lab. I would like to know what would be the temperature and pressure when it runs (after attaching the sample vessel). The Freeze drying light should stay "on" or "off" when the sample vessel is attach and VAC? Advise this member. Qiagen QIAxpert SystemI received negative numbers (e.g. -4.2, -58.0) when using QIAxpert. I have been using it for High Sensitivity DNA samples, selecting A260 dsDNA. As well, when comparing to the Qubit 2.0 equipment the majority of results are different and negative quantities compared to Qubit reads. Any ideas? Advise this member.